For years, "Turning Point at Cavalry Baptist Church and Academy" has held men-only "BEAST FEAST": dinner events with raffles to give away guns, including semi-automatic weapons. Yes, these are men-only events. Sounds a bit odd to me. BEAST FEAST: At a politically influential church attended by Sheriff's Deputy JEREMY BANKS' church, there's an annual event called "BEAST FEAST," where he men shoot and kill game animals; the women cook it and serve it to the men. Controversial Sheriff DAVID SHOAR and State's Attorney RALPH JOSEPH LARIZZA have attended BEAST FEAST in prior years, introduced with fanfare and music. 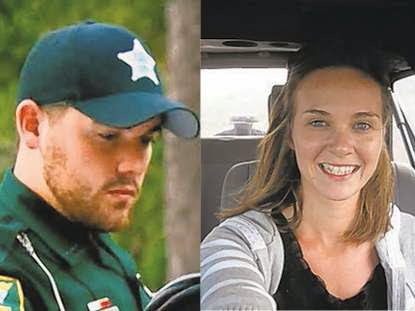 Both SHOAR and LARIZZA covered up the September 2, 2010 homicide of Ms. Michelle O'Connell in the home of Deputy JEREMY BANKS. Mosquito Control Commission Chair GARY HOWELL attends, too. Are the serving-women (including those married to, living with or dating Sheriff's deputies) permitted to buy raffle tickets that would give them guns for self-defense? Some people say St. Johns County is not unlike the tv drama "Twin Peaks," with Atlantic Ocean beaches. So I've asked the Pastor of Turning Point at Cavalry Church and Academy, Rev. Dr. Mark Conrad some questions, No answers. He's the father of St. Johns County Clerk of Courts and Comptroller Hunter Conrad. Both father and son used their respective letterheads -- one church and one state -- to send letters to the Republican Party of Florida in support of ousted St. Johns County Republican Chair WILLIAM KORACH, who filed their letters in Circuit Court (Rev. Dr. Conrad's letter is fuzzy, hard to read and incomplete, with no signature page. Both father (Mark Conrad) and son (Hunter Conrad) seem ethically impaired, misusing organizational letterheads for political purposes. This could put the church's 501c3 at risk. At the podium of the June 19, 2018 County Commission meeting, considering his annual budget, I told Clerk of Courts and Comptroller Hunter Conrad: "DON'T DO IT AGAIN." 1. Will "Beast Feast" be holding a raffle and giving away any more guns this year at "Turning Point at Cavalry Church & Academy?" 4. What permits or legal authority do you have? 5. Why are only men allowed to dine at "Beast Feast?" David Waters: Should a church raffle off a gun? Palm Sunday worshipers got a look at prizes to be raffled off at the church's BBQ Festival and Car Show later this month. A wide-screen TV. A large ceramic grill. A Yeti cooler. A set of golf clubs. It wasn't loaded. It wasn't fake, either. The Stoeger M3500 camo shotgun, a duck-hunter's dream that retails for about $800, was sitting on its box on a table in the church lobby Sunday morning. Should someone bring a gun into a church? Should a church raffle off a gun? WWJD? What would Jesus donate for a church raffle? My feeling is that Jesus would have overturned that table and turned the shotgun into a plowshare or something life-giving, not potentially life-taking. Then again, Hope Church plans to turn the raffle's proceeds into support for a church in southern Mexico. Are they turning a shotgun into a life-giving soup kitchen or schoolhouse? Hope Church isn't the first church to raffle a gun. A church in Paducah, Kentucky, raffled off an assortment of 25 handguns, shotguns and rifles at a "Beast Feast" dinner in 2014. Lone Oak Baptist Church did it to attract churchgoers, not charity funds. “The main goal is to share the gospel of Jesus Christ and to give people an opportunity of hearing the good news," Chuck McAlister of the Kentucky Baptist Convention told MSNBC. My 'piece' I give unto you. The prophetically named Ignite Church in Joplin, Missouri, held a free raffle for two AR-15 semi-automatic rifles on Father's Day 2015. That's the kind of gun used in mass shootings in Aurora, Colorado, Newtown, Connecticut, and San Bernardino, California, among others. Each father who entered the raffle also got a ticket for each child he brought to church. “If we get people in the door, we get to preach the gospel,” pastor Heath Mooneyham told the Joplin Globe. "If we can get more people to follow Jesus, I’ll give away 1,000 guns. I don’t care. Pick up your clip and follow me. It won't be that easy for whoever wins the shotgun at the April 28-29 BBQ and Car Show. "The winner of the shotgun will need to go through the standard background check and other paperwork with the merchant where the shotgun was acquired, before taking possession of the gun," Mike Sadler, men's ministry pastor. “The Beast Feast, a BBQ contest and car show, has been a staple of our men’s ministry for many years. Part of the evening is a raffle where various items are raffled off to raise money for mission endeavors in our city and around the world. "The items generally are things that our men are interested in- golf gear, fishing trips, grilling products, hunting items, automotive items, etc. This year, as in the past, we will raffle off a 12-gauge camo shotgun. Personally, I’m not a gun guy. Never have been. But I do understand many people’s love of hunting. Hope Church is not only one of the city's largest congregations; it's also one of the most diverse, generous and socially-conscious. Its members support an orphanage in Haiti, schools and clinics in Africa, not to mention programs for under-resourced children across Memphis. Still, in our gun-crazy and gun-weary city and culture, you'd think the church would be the one gun-free zone that wouldn't support or promote firearms.